1 Can I Be the Godmother of My Little Sister? Godparents play an integral role in the religious development of children in many cultures around the world. While different faiths have different requirements for becoming godparents and different tasks that godparents are responsible for, all faiths that acknowledge godparents recognize their important role in their godchild's spiritual life. The origin of godparents dates back to the early beginnings of the Christian Church. A sponsor was required for any person desirous of receiving the sacraments of baptism, holy Eucharist and confirmation. The role of the sponsor was to vouch for the person's character and to aid them as they prepared to take the sacraments. Around 800 AD baptism of infants became commonplace and their sponsors were referred to as "patrinus" in Latin, which translates to "godfather." After the Reformation the role of godparents in different faiths evolved somewhat from the historical Catholic role of godparents, but their overall purpose remained much the same. In some Christian faiths godparents play a largely informal role that may only be acknowledged by the family of the baptized child. In other faiths, namely the Anglican and Catholic faiths, the rules for becoming godparents and the expectations of godparents are quite well-defined and regulated by the governing bodies of each respective faith. In Christian faiths without set guidelines concerning godparents, it is often left up to parents to choose how many godparents they will designate for their child and what role they wish the godparents to play in the life of that child. Anglican parents traditionally choose three godparents for their child: two that are the same gender as the infant and one that is the opposite gender. Catholic parents normally designate two godparents for their child, a godmother and a godfather. These godparents must be practicing Catholics, but in some cases a Christian witness of another Christian faith is allowed, though this person will not be able to fulfill all of the tasks of a traditional Catholic godparent. Generally speaking, godparents should be active members of whatever faith their godchild is being baptized into. This is important because the primary duty of godparents is to act as good religious role models for their godchild and to ensure that their godchild will be brought up correctly according to the guidelines of their faith. Godparents are also expected to pray regularly for their godchild and to be readily accessible whenever their godchild has questions concerning his faith or needs spiritual support. 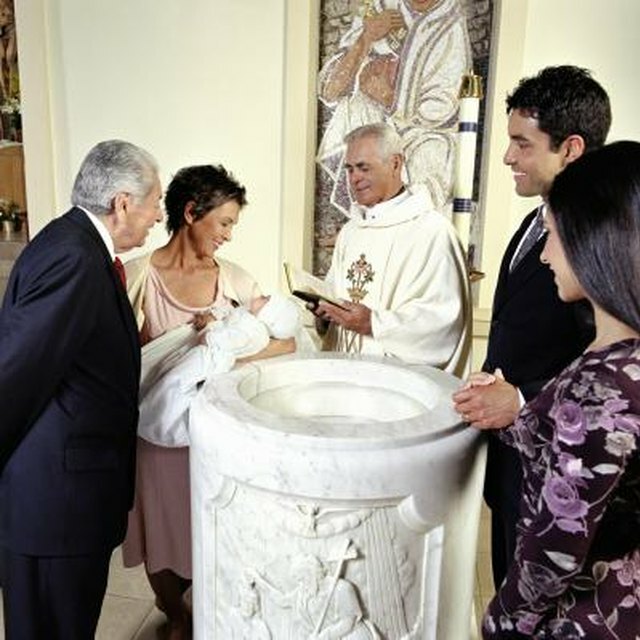 Godparents normally must be present at the baptism or christening of their godchild. They play an important role in the ceremony and often hold their godchild as he is blessed and accepted into his corresponding faith. During the baptism godparents also vow to fulfill all of the requirements set forth by their faith concerning their duties as godparents. Most godparents are either relatives of their godchild or close friends of the child's parents. While historically godparents were often named as guardians for their godchild should his parents die, in modern times this practice is no longer widespread. Godparents today are viewed as adults with a special interest in the well-being of their godchild and his religious upbringing. Godparents are usually named by an infant's parents soon after birth but before baptism, or at any point before baptism in faiths that do not practice infant baptism. These godparents are expected to play a role in their godchild's life, at least through their becoming full members of their respective churches as teenagers or young adults. Oftentimes godparents continue to have contact with and support their godchildren even as their godchildren enter adulthood.